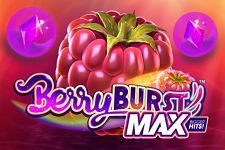 Berryburst MAX is one of the latest NetEnt titled to have hit the market, bringing players around the world the necessary dose of vitamins. Featuring a catchy soundtrack, as well as vibrantly coloured fruits on the reels, this game is guaranteed to bring you a ton of fun. Bear in mind this is the same game as Berryburst, only with volatility increased to the MAX. 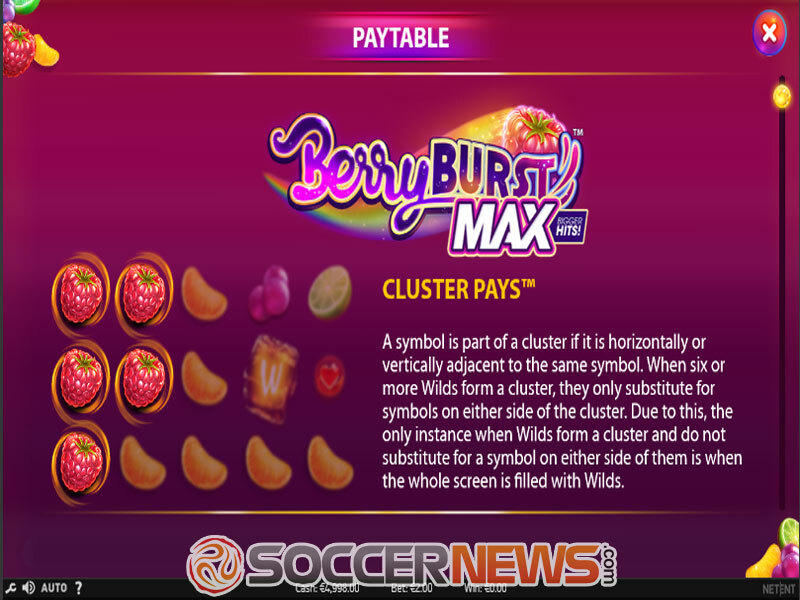 Berryburst MAX is a 5-reel, 3-row video slot using the Cluster Pays game engine. This means there are no traditional paylines, but instead, the symbols are grouped in clusters of horizontally or vertically adjacent icons. To get a win, you'll need a minimum of five symbols in a cluster. 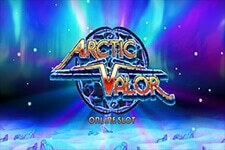 When it comes to features on offer, players will surely benefit from Wild substitutions, Expanding Wilds and Re-Spins. 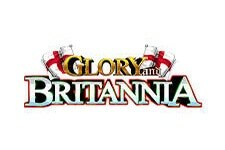 The game itself offers a dynamic playing experience and we suggest you give it a go as soon as possible. Be careful when choosing your bet. 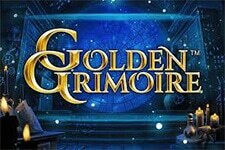 This is a high variance game and if you're an inexperienced player, you could quickly lose all your money. 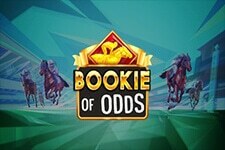 The game's coin denomination ranges from $0.01 to $2, while the wagering starts at $0.10 and goes all the way up to $200 per spin. The reels are transparent a feature a plethora of vibrantly-coloured symbols including hearts, spades and diamonds – with the latter appearing in a bubble – as well fruits such as limes, berries, oranges and raspberries. 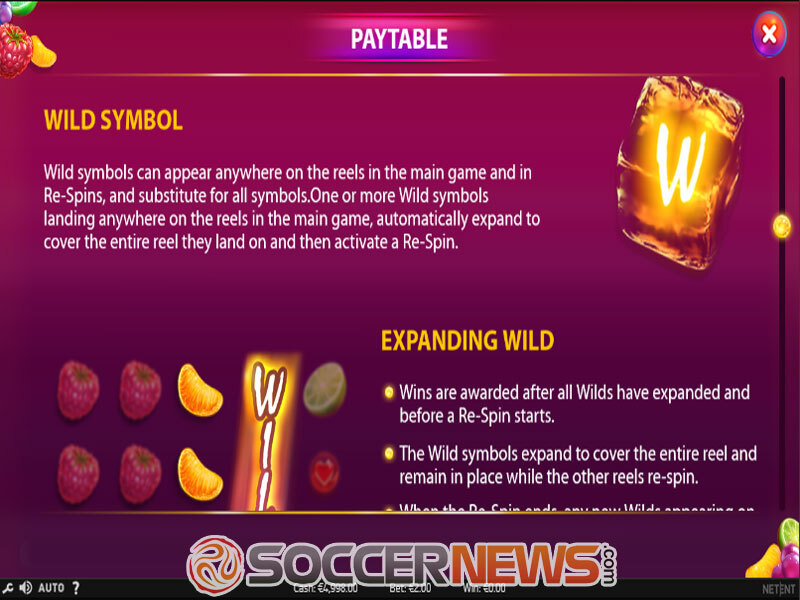 The list of symbols includes Wild which can appear in both the main game and in Re-Spins substituting for all other icons. When landing on the reels in them game, any Wild will instantly expand and cover the entire reel, while at the same time triggering a Re-Spin. The Wild will stay locked in its position, with a Re-Spin awarded, while other reels will respin. It's rather simple: get an additional Wild symbol and you'll receive an addition respin. It is possible to get all 5 Wild reels and in this case, expect a staggering payout worth 6,000x the triggering bet! 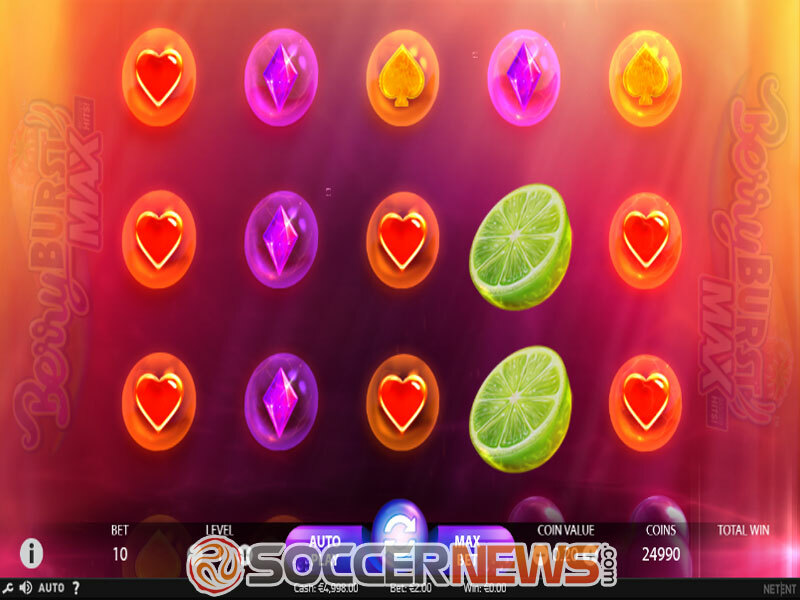 Visit any of NetEnt-powered online casinos and find Berryburst MAX. Enjoy this summer cocktail of supreme slot sweetness! 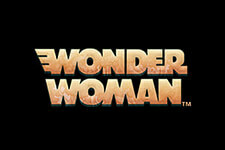 "First of all, the game features stunning visuals and a nice soundtrack, but above all, offers a unique playing experience. Its high volatility will appeal to those risk-hungry high-rollers, offering winnings higher than usual, but they won't be paid out often. 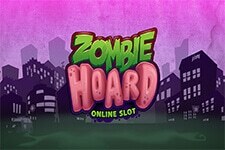 The slot could have offered a feature or two more, but believe us when we say you won't notice it."